The TradeWHEN system is the result of 20 years of research and development, and runs on our custom-developed software. TradeWHEN's systems typically require just 1 to 2 roundtrip trades per year. Other timing systems may require you to make up to 100 trades per year. TradeWHEN's systems do not generate whipsaw trades. Other computerized systems can change their mind from one day to the next, and have you pull out money you just put in yeterday. TradeWHEN can help provide consistent returns. TradeWHEN is specifically designed to smooth out the bumps on the stock market highway. Get more consistent and superior returns with minimal drawdown. TradeWHEN will never ask you to put all your eggs in one basket. Dozens of market timing signal sets are available. Diversifying your money among several sets of timing signals is just as important as diversifying your investments, and serves the same purpose. TradeWHEN is reasonably priced. Get on board for as little as ZERO dollars. TradeWHEN is not just one timing system - we generate a variety of trading signals tailored for different types of investments, enabling you to find good matches to the funds available in your IRA or 401k plan. The TradeWHEN Stock Market Timing system offers several ways to use our timing signals. It is possible to design systems for maximum profit, maximum safety, or a good compromise between the two. All charts on this page are from backtesting (simulated trading done in the computer.) 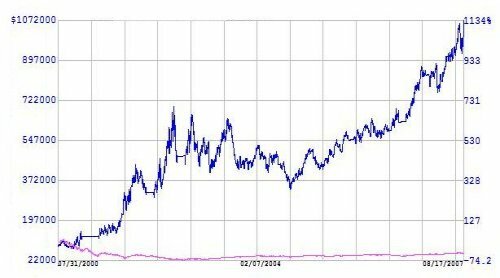 Many of the TradeWHEN timing systems have been used for real-world trading from 2002 to the present day, and the results are consistent with TradeWHEN's simulations. Be sure to scroll all the way down this page, to appreciate what TradeWHEN is capable of. Here's an example of designing for maximum gain. This chart is a result of trading the Rydex mutual funds RYVYX and RYVNX using TradeWHEN's TW001 signal. It shows how $100,000 invested eight years ago could grow to over $1,000,000. The red line at the bottom of the chart is the plain Nasdaq-100 index, for comparison purposes. 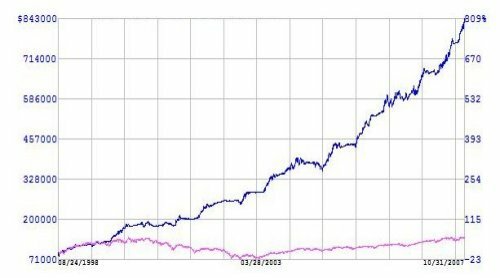 The chart shows a profit of better than 1100% over a period of about 8 years, from the year 2000 up to about August of 2007. That represents an average yearly gain of over 40%. Performance recently has been even better. Here's a chart showing the 3 year period between August 2004 through August 2007, with an annualized return of over 45% per year. Again, the red line at the bottom represents the Nasdaq-100 index. The Rydex fund RYVYX (leveraged) closely tracks the Nasdaq 100 index, but with the performance of that index multiplied. The Rydex fund RYVNX emulates the performance of the Nasdaq 100 index sold short, again with the performance multiplied. You should also be able to get very similar results to these by investing with the QQQQ exchange-traded-fund using leverage and short selling. The advantage of short selling and leverage is multiplication of profits. The downside is that risk and drawdown (negative fluctuations) are also multiplied. This means that high-profit rides like this one can be stressful. While you will make high returns overall, there will be periods of time when you don't make any profit, or lose some of your money. An example of playing the trading signals for safety instead of maximum profit would be to use our TW001 signal on the RYOCX fund, which also tracks the Nasdaq 100, but without any leverage. In this case, we would switch to cash or money market on sell signals, instead of short selling. When we do this, we get a still respectable index-beating 14% average annual gain, but without the wild swings we see on the first chart. As you may realize, not all predictions made by trading software can be accurate. However, when TradeWHEN trading signals are used in the safest way, we see a high ratio of positive trades: over 80% of the recommended trades are profitable. When trading at higher risk levels, as in the first chart on this page, the ratio of profitable trades dropped to about 50%. So here's the question of the day: Is it possible to design a system that incorporates both low risk and high profits? Yes it is. We believe we have created just such a system. 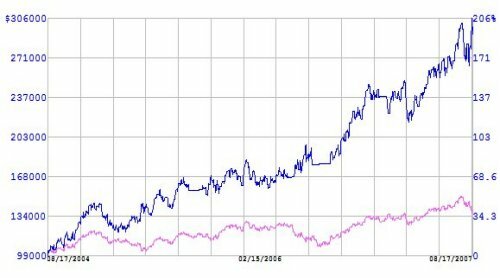 Below is a chart showing the performance of our TradeWHEN PRO PLUS multiple timing systems for nine years, from 1998 through 2007. The chart illustrates an average annual gain of close to 30% for the nine-year period, with drawdown that never even gets as high as 10%. The ratio of profitable trades is above 80%. No short selling or margin trading was needed or used. The red line on the chart is the S&P 500 index, just for comparison. The system in the chart above uses a mix of about 12 different TradeWHEN signal sets, traded on a handful of carefully selected mutual funds. Our charts page shows exactly how this works.